Barcelona June 15, 2018. 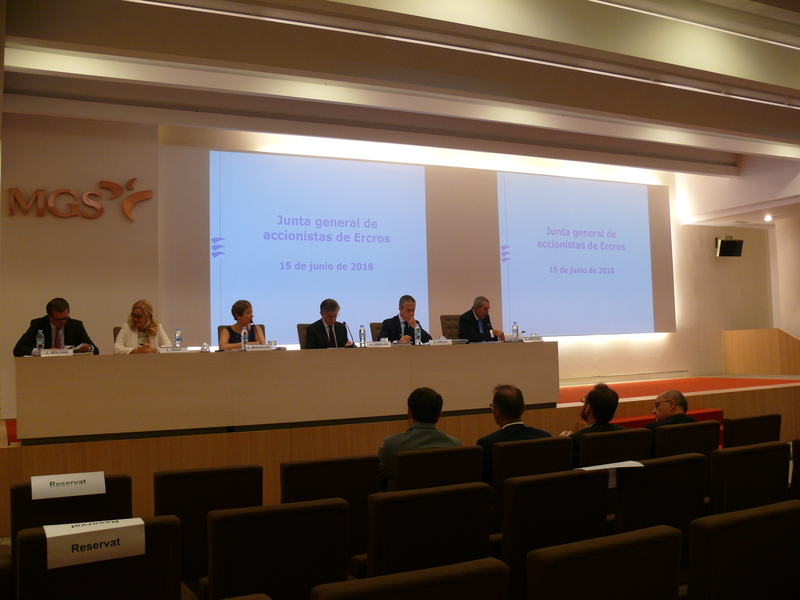 - The shareholders’ ordinary general meeting of Ercros, which was held today in Barcelona, ​​has approved all the items included on the agenda, which include shareholder remuneration measures, with a total amount of EUR 15.6 million, which equals 35% of the 2017 profit that was EUR 44.63 million. This amount is EUR 2.2 million higher than the figure that the Company dedicated to remunerate the shareholder in 2016 and which meant a disbursement of 30% of the profit for that year. The goal of Ercros is to achieve 50% of the benefit by 2020. The first of these measures, the payment of a cash dividend of EUR 0.05 per share, involves a disbursement of EUR 5.6 million (12.5% ​​of the profit). The second measure is the reduction of share capital in EUR 930,897 in order to amortise the 3.1 million shares acquired by Ercros amounting to EUR 10 million (22.5% of the profit). According to the president of Ercros, Antonio Zabalza, «After a year of experience, the repurchase and amortization of treasury shares has resulted in an increase in the profit per share and in the percentage of participation of each shareholder in the share capital, and likewise has provided liquidity to the share and has contributed to improve its price». In fact, throughout 2017, the Ercros’ share kept the ascending path begun in 2016; and this revaluation has continued in the current year. In the first moths of 2018, the share has been revalued as much as in the whole past year (55.4%) and the capitalization of the company is close to EUR 500 million. In his speech, the president highlighted the effort made by Ercros in 2017 to successfully complete the first phase of the Plan Act. According to Antonio Zabalza, «In addition to expanding our production capacity - which should be translated into an increase in the turnover, new investments lead to an increase in margins since the implanted technology is more efficient in energy consumption, has a higher utilization rate of plants and more competitive fixed costs, both in personnel and maintenance costs. Finally, after the total execution of the Plan Act, in the middle of next year, our industrial park will have undergone a very important renovation, which will place the main industrial processes of the Ercros’ three divisions on the present technology frontier». The president stressed that despite the industrial and financial challenge posed, the largest volume of resources generated by the company is allowing compatibility of the Plan Act financing, with a level of debt under EUR 100 million: «This moderate debt and the good results have allowed us to comply with the conditions set out in the shareholder remuneration policy». Regarding the progress of the activity in 2018, the president assured that, in view of the first half of the year estimations, which foresee an ebitda of EUR 41 million and a profit of EUR 27 million, and despite the second half of the year includes August and December, which are seasonally low months, the improvement shows a good result for the whole year. The meeting had attended by 7,526 shareholders holding 78,793,965 shares, representing 70,999% of the subscribed capital.